a raid on January 14. A legion of fully armed policemen and government officials arrived to demolish the kindergarten and blocked both parents and teachers from leaving their homes. The “Wheat School,” a kindergarten jointly founded by Xunsiding Church and parents, was located in the Jimei district of Xiamen. As early as May of last year, the kindergarten was forced to close down by the Fujian authorities. At that time, the church received a notice issued by the departments of religion and education accusing the kindergarten of not being authorized to engage in early childhood education. To protest the shutdown of the kindergarten, many parents took their children to sing and pray at the entrance of the kindergarten. rcement bureau of Jimei District on Dec. 29, 2018, there were three areas where the anti-theft facilities were constructed illegally, and there were potential safety hazards. When the decision was made to tear down those facilities, the church objected and appealed the decision for administrative reconsideration. Unexpectedly, the authorities sent a team to tear down the facilities during the appeal process. 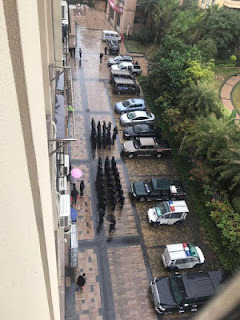 On the morning of Jan. 14, a legion of heavily armed police and officers from the administration and law enforcement bureau went to tear down the kindergarten located at Yuanbo Liuli on Xinglin Street. According to some church members, the police put on riot equipment to confront a group of unarmed Christians and children. Demolition of the kindergarten's iron gates and other protection facilities lasted for more than an hour. During that period, the police blocked the parents and teachers from leaving their homes. Each household was guarded by five to six policemen so that they could not leave. According to experts, Chinese laws and procedures maintain it is illegal to execute “enforcement” while the school is in the process of appealing for administrative reconsideration. Suppression of Christian house churches by Chinese authorities has affected schools, nursing homes, and kindergartens founded by churches.